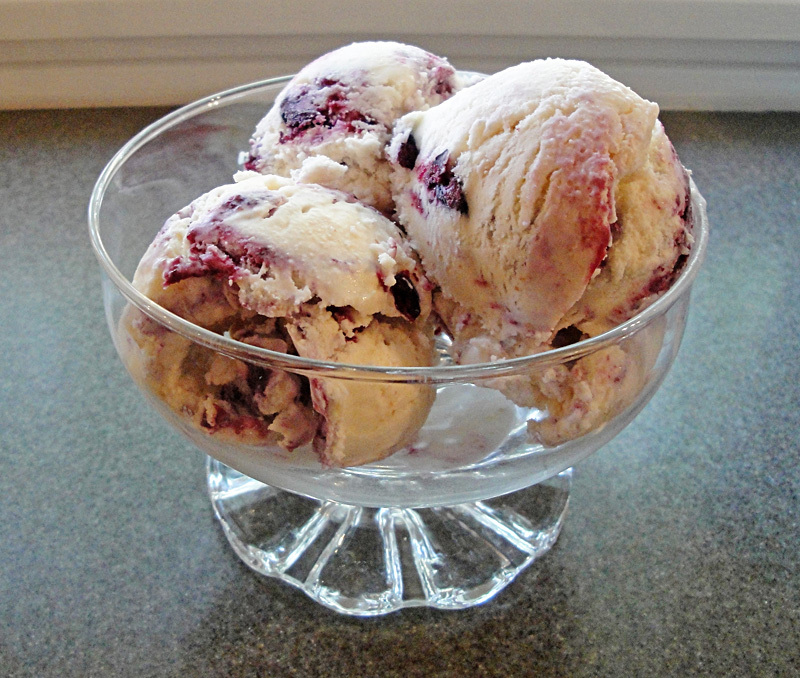 Tagged with " frozen treats"
I’m back with another Jeni’s ice cream recipe. After making Salty Caramel ice cream, I wanted to try a flavor that was much more simple. 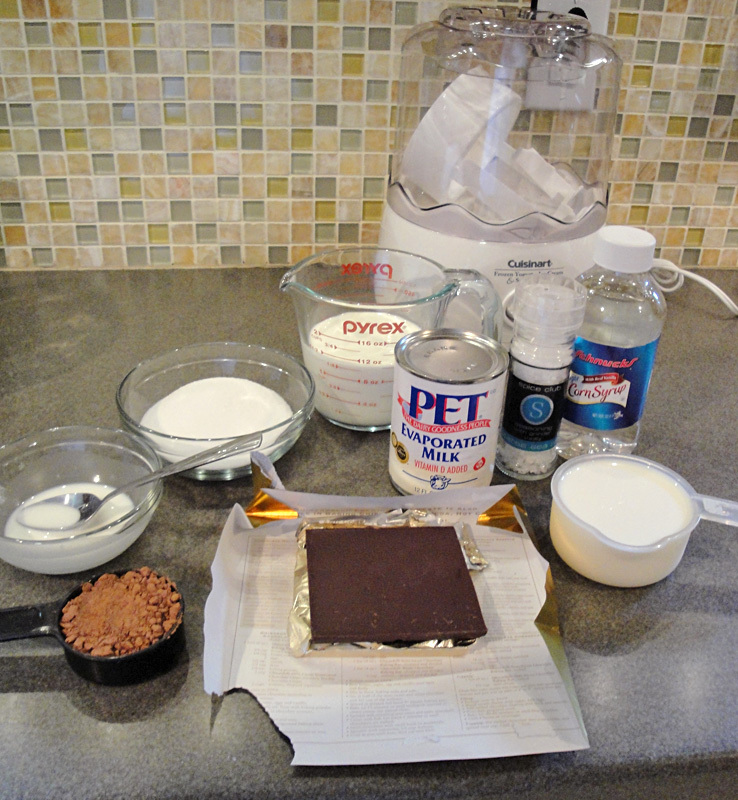 A classic chocolate recipe sounded perfect. 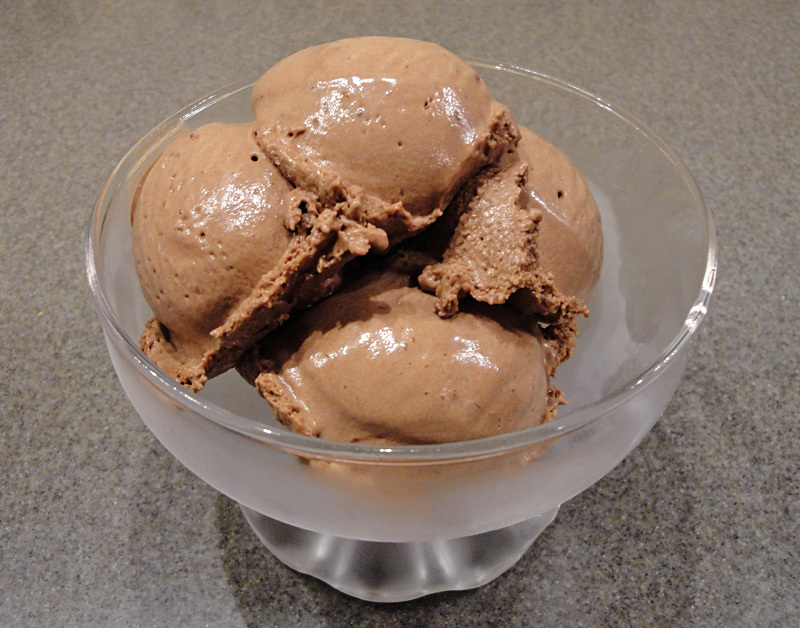 I decided to try the recipe for The Milkiest Chocolate in the World Ice Cream. I don’t want to keep republishing all of Jeni’s recipes since I think her book deserves the credit and it explains a lot of the process in it but I will show you the ingredients and say the process is very similar to that of the first recipe I tried. One note, Jeni’s recipe in the book has a small typo so make sure to check her website for updates to the book. In this case you need 1 1/4 cup of cream instead of the 1/4 cup that is printed in the book. In this recipe you don’t use cream cheese, instead you use evaporated milk. Jeni explains that the goal is to keep the chocolate taste more pure which I’d say she accomplished in this recipe. The change in ingredients leaves the ice cream tasting a little sweeter too. My husband described the flavor as chocolate ice cream in a waffle cone. That enhancement made this ice cream taste anything but simple. I wished in a way that the flavor had more distractions because chocolate was the star and a whole bowl might be a tad overwhelming. The only problem I’d say exists with this recipe is how thick it gets. With cocoa, cornstarch, and chocolate there’s a lot of chance for clumps to form in the ice cream. To remedy this I suggest sifting the cocoa before you add it to the pot. Then run the ice cream base through a sieve first as you add it to the chocolate and again as you put it in its chilling bag. You want this ice cream to be as smooth as possible to get the purest taste. Also, Jeni suggests freezing this ice cream for at least 4 hours but I’d recommend going overnight. 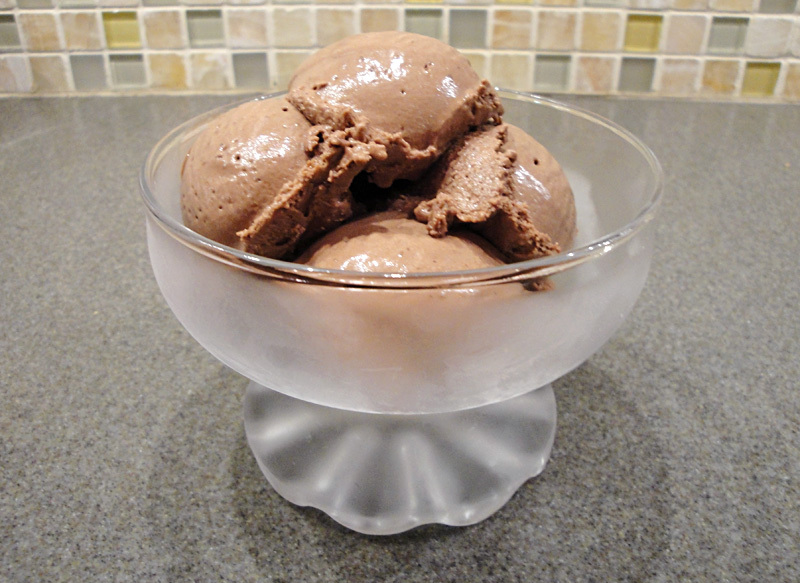 The ice cream really solidifies and the flavors enhance overnight. I know waiting is hard but trust me, it’s worth it. A little bit ago I shared my experience trying a pint of Jeni’s Splendid Ice Cream and a review Jeni Britton Bauer’s very own cookbook . This weekend I finally made good on my plans to try my hand at making one of Jeni’s ice creams from her cookbook. I decided to try my hand at a recipe that didn’t include any hard-t0-find ingredients and would be a flavor both my husband and I would probably enjoy. That’s how I ended up with my cookbook turned to the recipe for Salty Caramel Ice Cream. It’s Jeni’s most popular flavor so why wouldn’t I want to try that? Before you start this recipe, measure out every single ingredient and prep all your equipment. 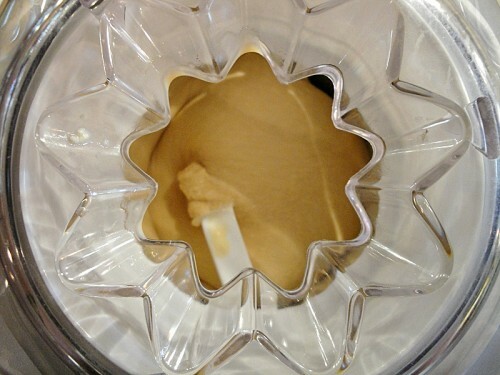 Your ice cream maker should be frozen 24 hours before even starting. I even poured my milk into a measuring cup so I could pour quickly when the moment came. The first half of this recipe goes low and slow and then suddenly you’re all in, racing to get everything in the recipe so you can start counting down the half hour it takes to chill it. For all things stovetop, I used a 4-quart pot for the process. I wouldn’t risk going any smaller than that with all the boiling this recipe takes. Now the next part was the scariest for me: I had to make caramel. I don’t do well with sugared products because I’m impatient and easily distracted and that usually leads to sugar burning. Jeni has you make the caramel for your recipe by using the dry burn technique (see recipe notes) where you just heat sugar on the stovetop until it starts going through a transformation and then you invite all the other pieces of sugar to the party by melting them down. Jeni says the look you’re going for is an “old penny” but I wasn’t sure if she meant 2001 penny that has seen my whole town or a 1953 penny that looks like it’s going green so I chose the more appetizing color. It seems to have worked out. Somewhere in the middle of the stirring process you’re likely to think you’ve failed and there’s an awful goopy mess but 1 minute later you’ll be screaming in glee “I’ve made caramel!” Embrace that moment because this is when the going gets crazy. 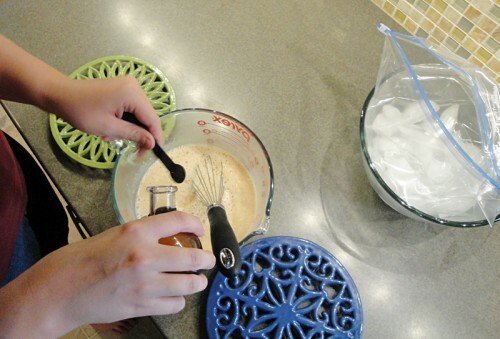 You’ll then pour your ice cream through a sieve placed over a bowl with your cream cheese and salt in it. All the little hard pieces of caramel will be left behind and then you stir stir stir! Make sure to add the vanilla in this step. I use my own homemade vanilla but whatever you choose, make sure it isn’t imitation. You’ll then want to chill your ice cream base as fast as possible. Pour your mix into a gallon sized Ziploc bag, seal it, and surround it with ice and ice water. Chill in your fridge for half an hour. Note: It’s very important not to let water get into your mix at this point. 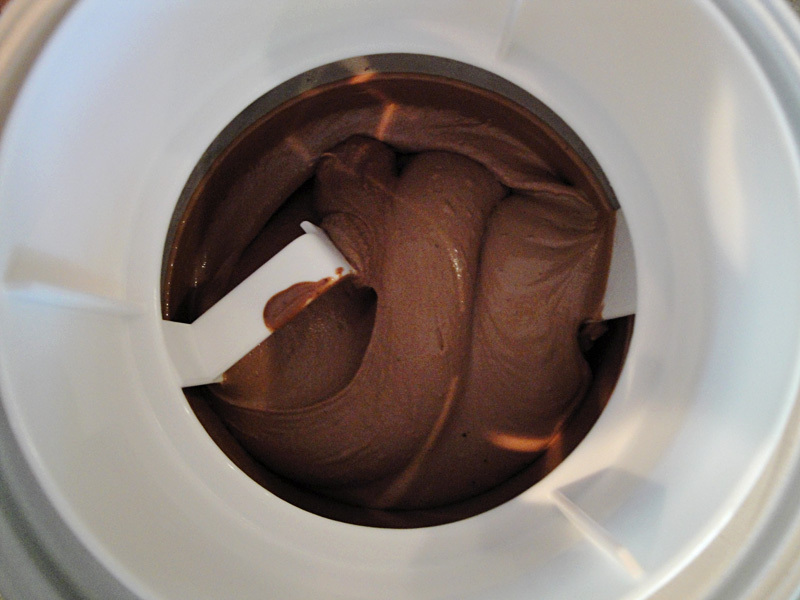 After your half hour is up, pour the mix into your ice cream maker and let it run about half an hour. Now you have to freeze it for at least 4 hours. Overnight is even better. I know, I’m a cruel and awful person to suggest such a thing. I scooped up a batch after waiting and sat down to test it. It was so smooth, just like the version I bought in the store. You can copy that quality perfectly in your own kitchen. My own version was lighter in color than Jeni’s official version so maybe you should aim towards an older penny than I did. I also expected more salt but that’s an easy fix. Overall I was thrilled with my results and have to say this is the best (but also the most complicated) homemade ice cream I’ve made to date. The only real disappointment I had was that it was eaten up so quickly. I guess I’ll need to make another batch or try a new flavor. If you’re a Jeni’s fan, let me know what flavor I should try next. Heat the sugar in a 4-quart saucepan over medium heat until it is melted and golden amber in color (see note below). 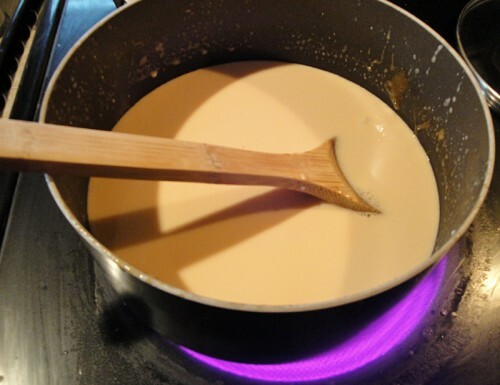 Remove from the heat and, stirring constantly, slowly add a bit of the cream and corn syrup mixture to the caramel: It will fizzle, pop, and spurt. Stir until well combined, then add a little more and stir. 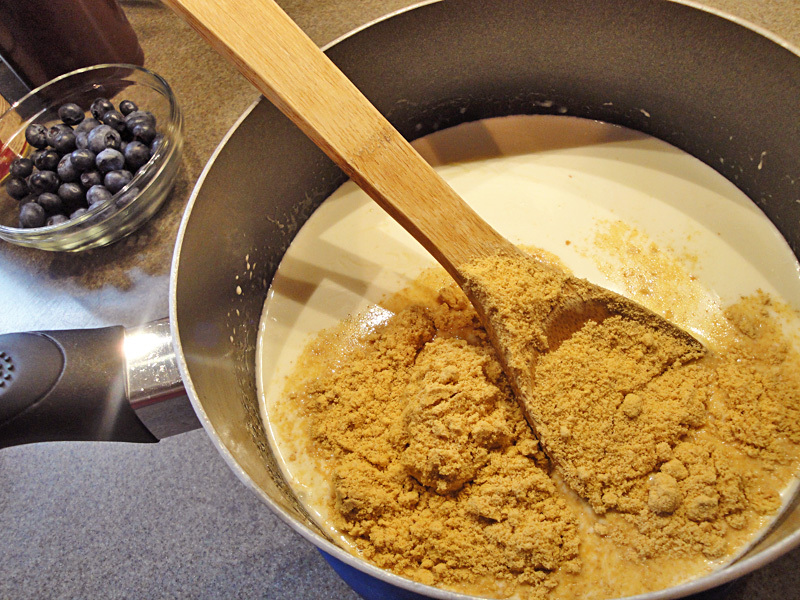 Keep adding the cream a little at a time until all of it is incorporated. Pour into frozen canister and spin until thick and creamy in ice cream maker. Do any of you remember those Polar Pizzas or Treatzza Pizzas from Dairy Queen or Baskin Robbins back in the 90s? If you don’t, you missed out. The ice cream pizzas usually had an Oreo or cookie crust, some ice cream, and a batch of toppings that would send you to a sugar coma. I remember my brother getting one at his birthday party and being very jealous that I had just had a homemade cake at my own party a month earlier. Flash forward to last week when we had 90 degree temperatures at the end of March/beginning of April. My husband and I were spending hours outside building a retaining wall and yet we were too stubborn (aka cheap) to turn on the air conditioner. I was desperate to find a way to cool off and then I remembered those pizzas. I took some cookie dough and pressed it into a pie pan. I risked a quick bake in the oven and cooked the dough about 15 minutes. After the cookie cooled on the counter, I popped it into the freezer. Just before dessert time I thawed about 5 scoops of ice cream (you might need more if you use a bigger pie pan) and then I smoothed it into the cookie dough base. To keep with the sugar coma memories of my childhood I drizzled on some Magic Shell and then sprinkled on some mini chocolate chips and some mini-Reese’s Pieces leftover from my Christmas cookies. It was some delicious frozen cookie pie, just like I remembered. 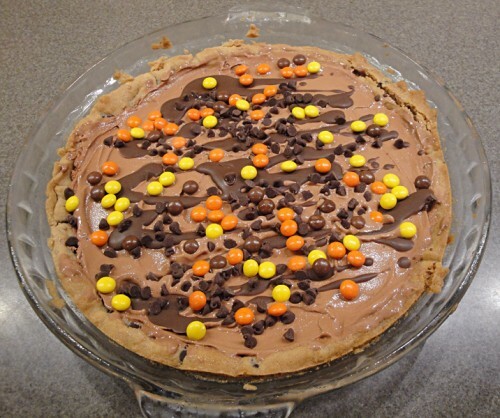 Press the cookie dough into a pie pan, shaping the extra dough along the edges to resemble a pizza crust. Bake for 15-20 minutes at 350 degrees. 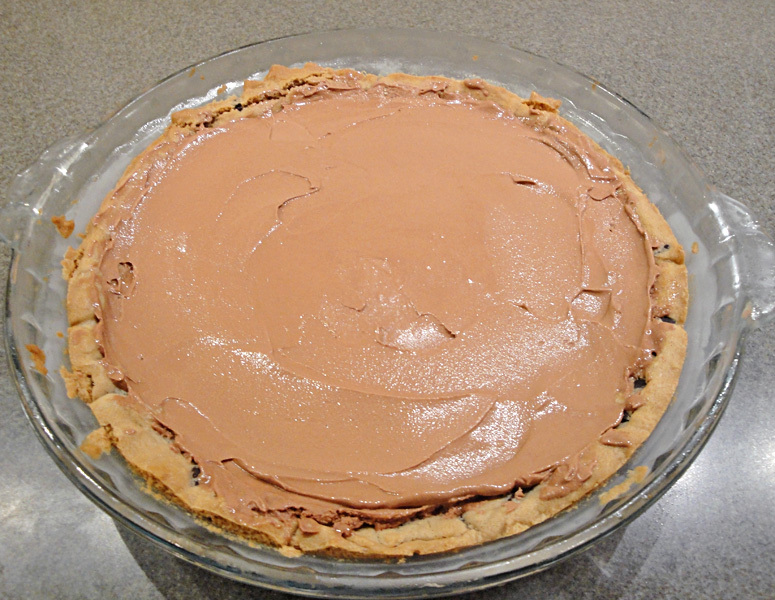 After cooling, place the cookie pie in the freezer for at least 2 hours. Thaw ice cream for about 1 hour minutes before your serving time. 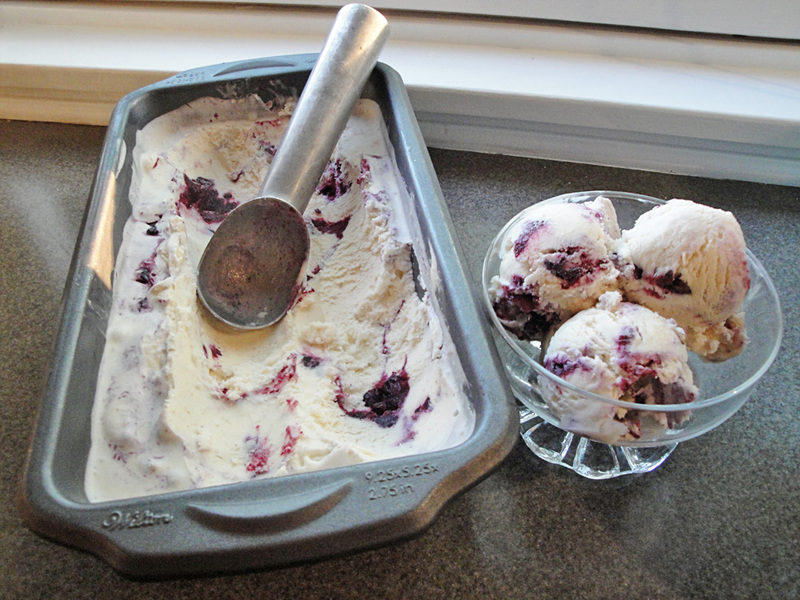 You can skip this step by scooping the ice cream into a bowl and microwaving about 10 seconds. 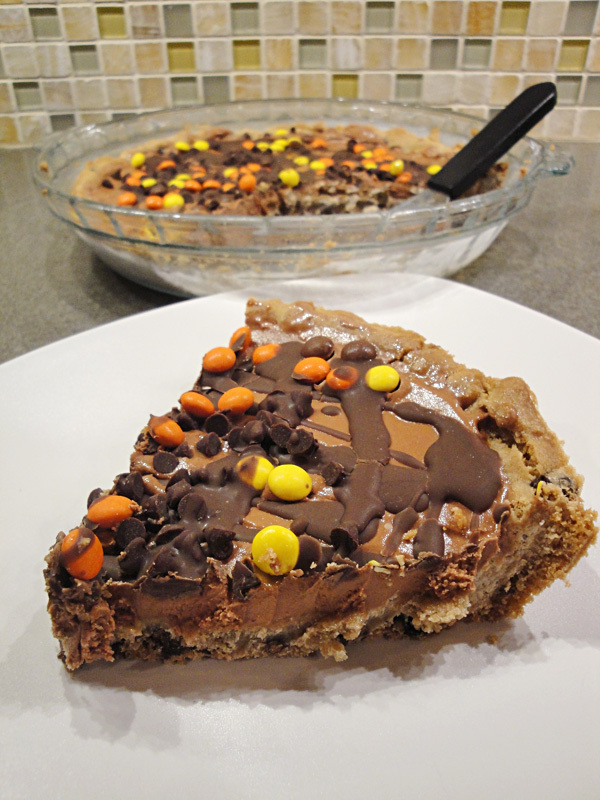 Smooth the ice cream into the center of the cookie pie and refrigerate for 1 hour. Pull the pie back out of the freezer. Drizzle with magic shell and sprinkle with candies. Use a warm knife to cut the cookie pie and serve. A few years ago I had a friend mention to me that she had discovered a new ice cream place. She said it was an amazing place but considering she lived in Ohio I wasn’t going to make the drive. Besides, the had mentioned that her favorite flavor was olive oil. Olive oil? In ice cream? I was unconvinced. 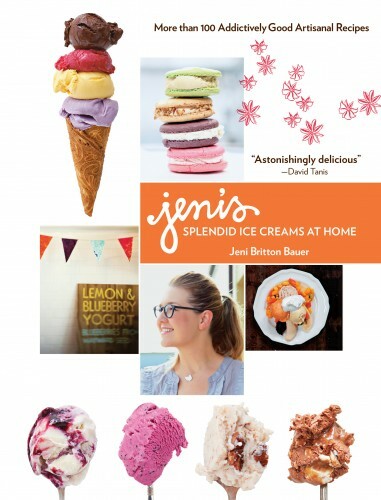 Then one day I discovered this amazing book, Jeni’s Splendid Ice Creams At Home by Jeni Britton Bauer. Flipping through the book I quickly realized this was the Jeni of Jeni’s Splendid Ice Creams that my friend had told me about. The book even had the recipe for that same olive oil ice cream. The book is so much more than a cookbook; Jeni shares advice on ingredients, entrepreneurship, and her growth in the kitchen. I really love how Jeni shares her failures and how owning a restaurant is so much more than knowing how to cook. It’s very refreshing. I read the book, saw all the amazing recipes and fell in love. I wondered in my head if I wasn’t overhyping how good her ice cream really was. I had to find out for myself but there was no way I could drive to Ohio. Enter Straub’s Markets. 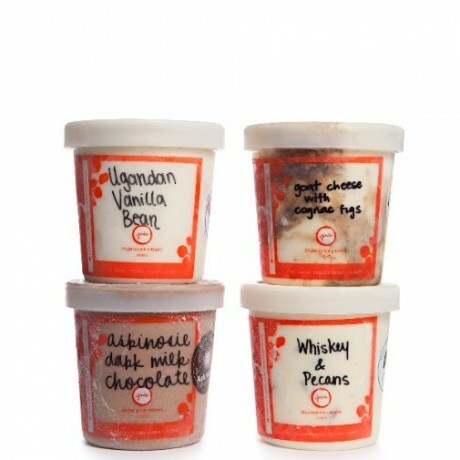 Jeni’s has retail partners across the country that stock the ice cream flavors Jeni created. In St. Louis, Straub’s is the closest location to me that carries her ice creams. I was already across the river at a museum so I stopped by Straub’s to see their selection. 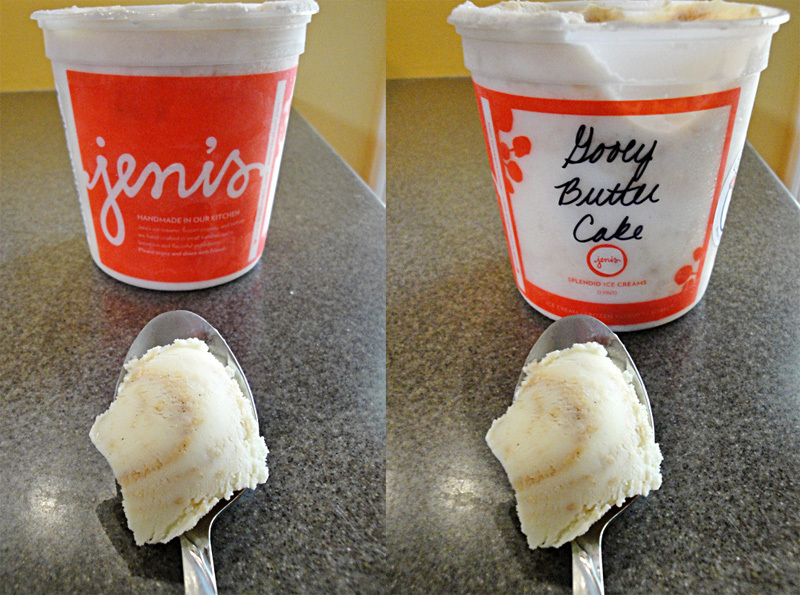 They didn’t have that infamous olive oil flavor but they did have Jeni’s Gooey Butter Cake Ice Cream. As STL locals know, gooey butter cake is our thing. Did an outsider have what it took? Jeni nailed it. The hype around Jeni’s is that her ice cream isn’t full of ice crystals like all those other ice creams. It was weird taking that first bite and not hearing or feeling that usual crunch you feel when you eat most ice creams. This really was just like eating cream. Cream that was flavored with honey, butter, and butter cake. You can tell this is quality ice cream from your first taste to your first look, with so many vanilla beans lacing the ice cream. 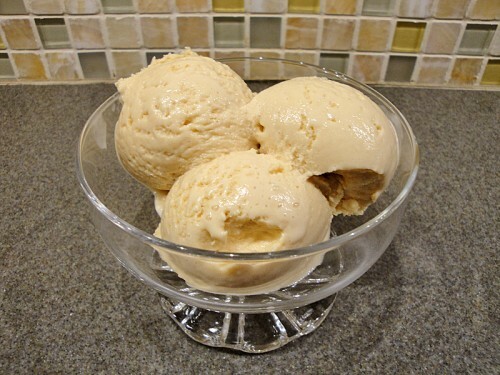 Gooey butter cake ice cream is one of the many recipes Jeni includes in her book. She has 53 ice creams, 7 frozen yogurts, 9 sorbets, and 13 desserts in her big book of recipes. She divides the book up into seasons so you can mimic her love of fresh, seasonal goods in your ice cream making. For spring she has a twist on classic strawberry ice cream with her version- Roasted Strawberry & Buttermilk Ice Cream. Summer has a more dramatic twist in the Sweet Corn & Black Raspberry Ice Cream. You can tell Jeni loves autumn because most of her recipes fall in this category and this is where you’ll find that olive oil ice cream, her most famous salty caramel ice cream, and even a nod to her beloved Ohio with The Buckeye State Ice Cream (Honeyed Peanut Ice Cream with Dark Chocolate Freckles). Winter is where Jeni keeps her top chocolate recipes so feel free to indulge. Expect lots of posts coming up this spring and summer as I start making some recipes from Jeni’s Splendid Ice Creams At Home as I attempt to fill up my freezer with some amazing treats. I’m already searching the stores for rhubarb so I can tackle one of her frozen yogurt creations. Have you been to Jeni’s? I’d love to hear your favorite flavors so I know what to make next.